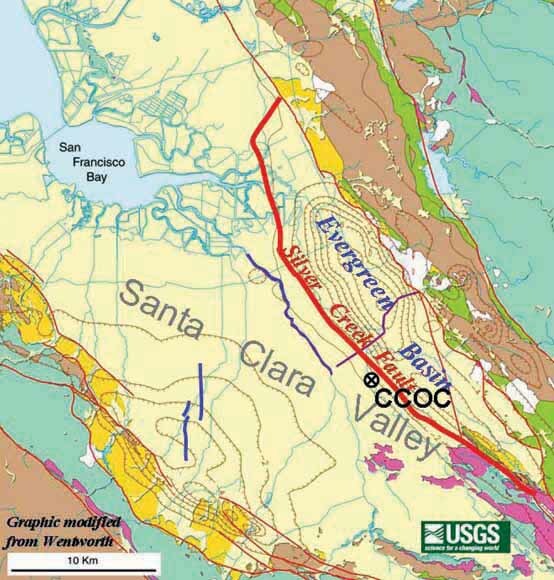 Location of the Coyote Creek site, east of the Silver Creek fault, Santa Clara Valley (from Wentworth and Tinsley, 2005). Shear-wave velocities within several hundred meters of Earth's surface are important in specifying earthquake ground motions for engineering design. Not only are the shearwave velocities used in classifying sites for use of modern building codes, but they are also used in site-specific studies of particularly significant structures. Many are the methods for estimating sub-surface shear-wave velocities, but few are the blind comparisons of a number of the methods at a single site. The word "blind" is important here and means that the measurements and interpretations are done completely independent of one another. Stephen Hartzell of the USGS office on Golden, Colorado realized that such an experiment would be very useful for assessing the strengths and weaknesses of the various methods, and he and Jack Boatwright of the USGS office in Menlo Park, California, in cooperation with Carl Wentworth of the Menlo Park USGS office found a convenient site in the city of San Jose, California. The site had good access and space for conducting experiments, and a borehole drilled to several hundred meters by the Santa Clara Valley Water District was made available for downhole logging. Jack Boatwright asked David Boore to coordinate the experiment. In turn, David Boore persuaded several teams to make measurements, helped with the local logistics, collected the results, and organized and conducted an International Workshop in May, 2004. At this meeting the participants in the experiment gathered in Menlo Park to describe their measurements and interpretations, and to see the results of the comparisons of the various methods for the first time. This Open-File Report describes the results of that workshop. One of the participants, Michael Asten, offered to help the coordinator prepare this report. Because of his lead role in pulling the report together, Dr. Asten is the lead author of the paper to follow and is also the lead Compiler for the Open-File Report. It is important to recognize that most of the participants in the experiments contributed at their own expense. It is gratifying that many people recognized the importance of the experiment and were willing to volunteer their time and resources. We thank them for this effort. This Report is organized in three parts: the first part is a paper summarizing the results of the Workshop, and presenting some conclusions regarding the various methods; the second part is a compilation of those documents describing the experiments that were presented at the meeting (a few of the reports have had minor post-meeting revisions, but with only one exception noted later, none of the models were changed). The final part of this Report is a compilation of the presentations from the meeting -- these are largely in the form of Powerpoint files. No attempt has been made by the compilers to edit the material in parts 2 and 3. It is included here as is for the benefit of the reader.